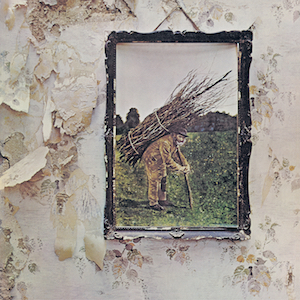 I’ve been listening to Led Zeppelin’s untitled fourth album from 1971. Each week I devote to an acclaimed album to learn as a songwriting musician. As with “Dark Side of the Moon” by Pink Floyd, I grew up hearing this Led Zeppelin album often. I imagine many of us born in the 70s did. Even with all of that exposure, it’s still a great album with surprises. The fourth track “Stairway to Heaven” pulls together the greatest qualities of the album into one song. As an unfortunate side effect of being one of the greatest songs ever, it has become amazingly overplayed. I sigh with lack of interest when the song starts. My favorite portion of the song starts at after five and a half minutes. First, the guitars signal a transition through a dramatic series of chords sounding like horns. Jimmy Page then provides a fantastic soulful guitar solo. I like that the they did not distort the rhythm guitar to get a rocking sound. They gave it a sense of being big by double-tracking with some strong spring reverb. There, I talked about “Stairway to Heaven” mostly because I’d feel foolish not mentioning it. Seriously, I skipped it many times this week. “Four Sticks” got my attention this time around. I hadn’t given it much attention in the past, so it still had a little sense of novelty. Also, the unusual rhythm of the song intrigued me. Some research revealed that most of the song is in a very unusual 5/8 time, withe some parts in a more common 6/8. I read that the rhythm of the song was so difficult that they almost gave up on recording the song. I hear a few times on the recording that they do slip up as a result. There’s a vaguely middle-eastern feel to the music. This comes from the combination of odd time signature, droning ascending scales, driving percussion, and energetically strummed acoustics. I sometimes find that songs in odd signatures will feel like they drift or ramble, but the 6/8 sections of this song give a sense of journey. Smoked my stuff and drank all my wine. Going To California with an aching in my heart. Speaking of Tolkein, my other favorite track is “Misty Mountain Hop.” There’s also something unique about the rhythm of this song. The main riff of the song, which is played on both guitar and electric piano, actually starts an 8th note before the first beat of each measure and least for a full quarter. This song provides an a great example of what I first think of as the Led Zeppelin sound. There’s big loud drums, a heavy bass bottom, a blues-inspired hard grooving guitar riff, and Plant’s high-pitched vocals. The narrative lyrics describe a situation, a certain place and time, written with an ear to both blues and high fantasy balladry. So I’ve learned a bit about the possibilities of mixing time signatures in a song. Their use of mysticism and fantasy elements is most enjoyable for me for telling real-world narrative. In addition, the way that they double-up on instruments to strengthen a riff is very effective. And you can’t deny the power of big drums.